Although the implementation of ICD-10 has been delayed, we have added the full ICD-10 listing to the system. We have also integrated the General Equivalence Mapping (GEM) a.k.a. the crosswalk. 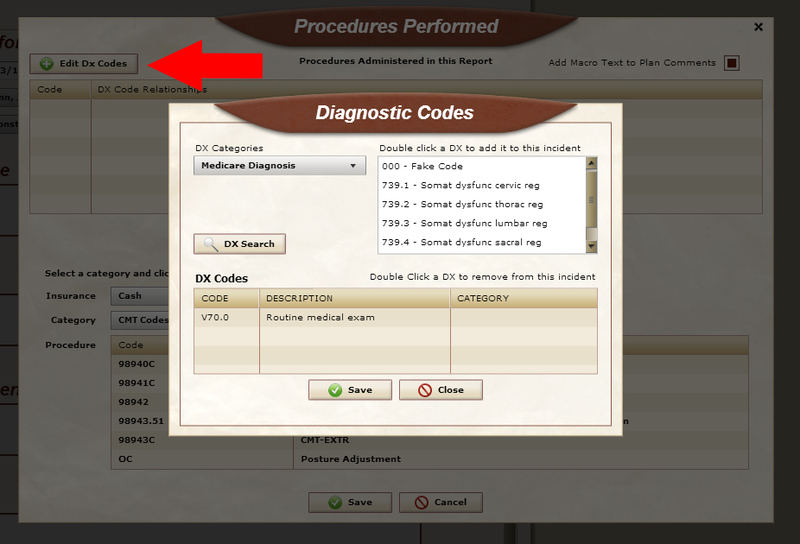 Throughout the system you’ll see the ability to search either the ICD-9 listing or the ICD-10 listing. When searching for an ICD-9 code you will see a crosswalk icon come up. Clicking on that icon will open the crosswalk and give you the ICD-10 code for the ICD-9 code you searched for, according to the GEM. We have added the functionality to apply a payment to a visit. In the Billing Queue, you will see a new option to manage payments for this visit. If you are a Kareo user, this payment information will transfer with the encounter. 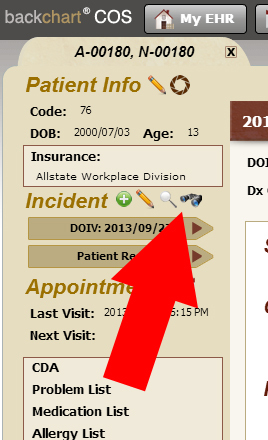 We’ve added a search feature that allow you to search through a patient’s reports. You will see a new icon next to the incident which will bring up the search box. To save time, we’ve added the ability to send your encounter to Kareo into your approved queue instead of your drafts queue. You can modify the default by going to System->Admin->Client Settings->Bill Submission. Stage 2 of Meaningful Use requires the use of a new exchange document standard. We have updated our generator from the previous standard, CCD, to then new standard, CCDA. 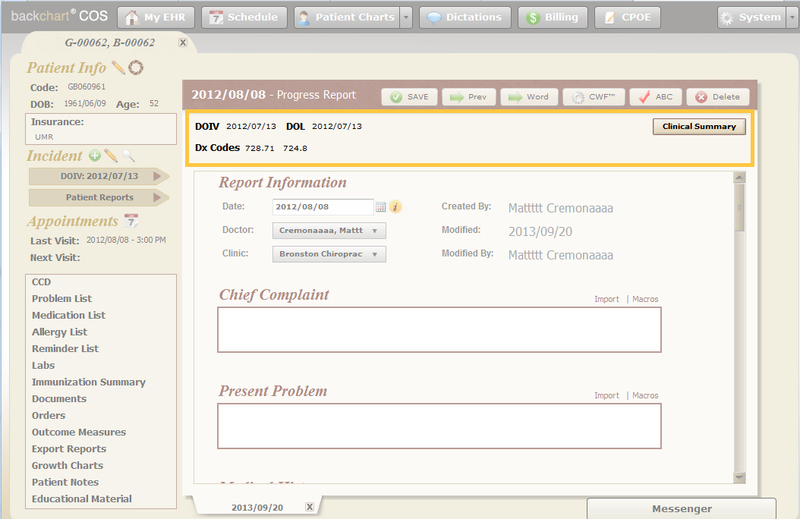 Many users were having issues with the CQM reports taking too long to run and therefore giving them an error message. Many of the reports can take a few minutes to run. Simply select which report you’d like to see and click “Request”. The report will run in the background. 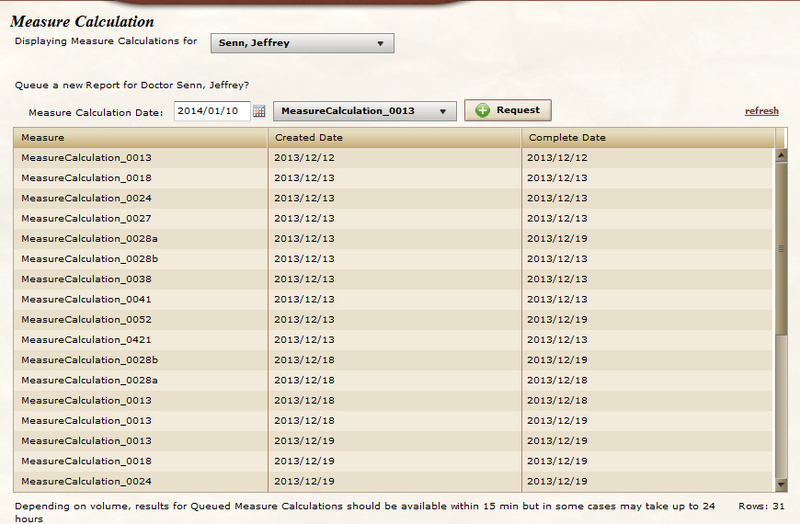 Check back in a few minutes and click the CQM in the list to see your score. 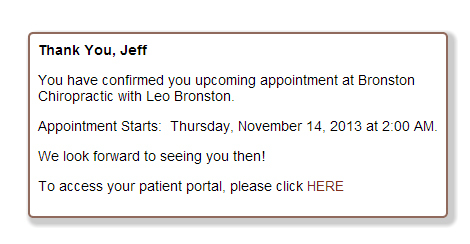 Patients can now receive appointment reminders via email. Within the email is a link the patient can click to confirm their appointment. Once confirmed, the appointment will change color on the schedule. 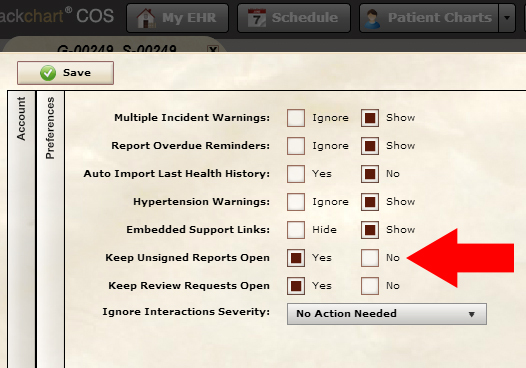 These can be enabled for the patient in their Patient Portal Settings or can be enabled by the patient from their account page in their portal. The text of the email can be customized in the email settings of the BackChart system admin. We have added a new document view to make looking at uploaded documents easier. The viewer allows you to look at a file without the need to download it. We added a user preference that will keep the unsigned reports list and review requests list open as you work through them. This can save time if you are reviewing multiple charts in a row. The lists can be resized by clicking and dragging on the lower right corner and they can be moved around the screen by clicking and dragging at the very top of the window. Items that are assigned to the patient in the Educational Material section of the patient chart can now be accessed by the patient from within their Portal. We added a button to the Procedures Performed window that allows you to make changes to the patient’s diagnosis directly from this screen. 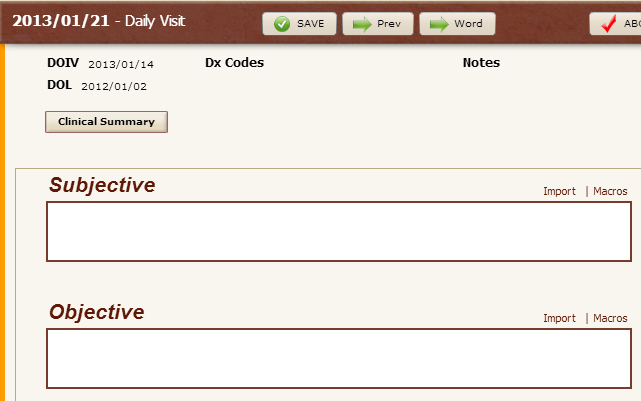 Allergies listed in the Medication Allergies List can now be imported into your visit note. 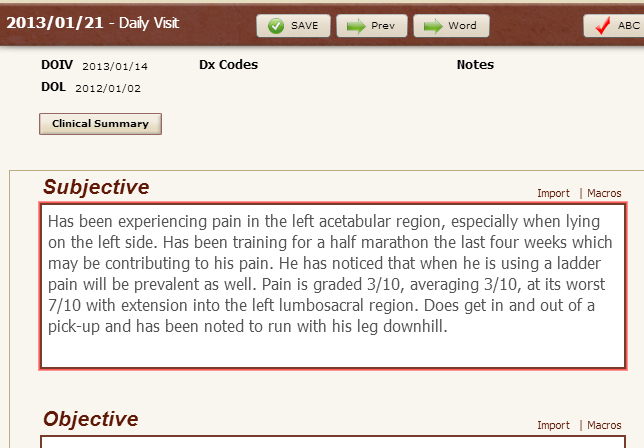 The diagnosis listed on the Incident can now be imported into the Clinical Impression and Assessment fields. We rearranged the top of the visit note area. This new arrangement is not only cleaner looking but also gives the user more space to write their visit note. 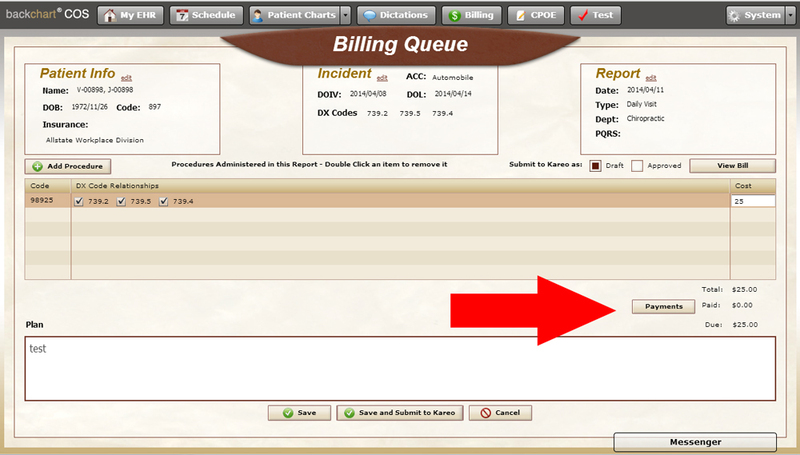 We added the ability to search the Billing Queue by patient. We added a filter for user in the audit log so you can see all the activity of just one user. We also added the ability to export the audit log into Excel so you can perform any custom analysis you need. We’ve added video links throughout the system to make training simpler. They can be enabled on any user account by selecting Show Embedded Support Links on the Preferences tab of My Account. Macros can now be dragged and dropped into what ever order you’d like. 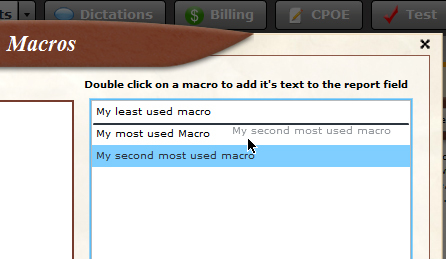 Place your most frequently used macros at the top or group similar macros! We changed the way emails sent to patients look. We also moved all the email setting in System Admin to a new sections called Email Settings. Don’t forget, you can customize these messages. The instant messenger allows you and your staff to effectively communicate within the office. 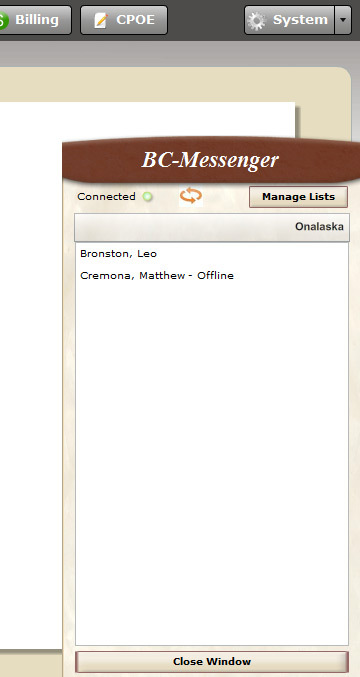 We will be rolling the messenger out to our users gradually next week. 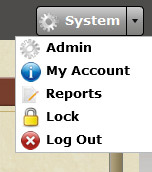 The session lock allows you to quickly lock BackChart if you need to step away from your computer. When you return, simply enter your password and you’ll be able to pick up where you left off. 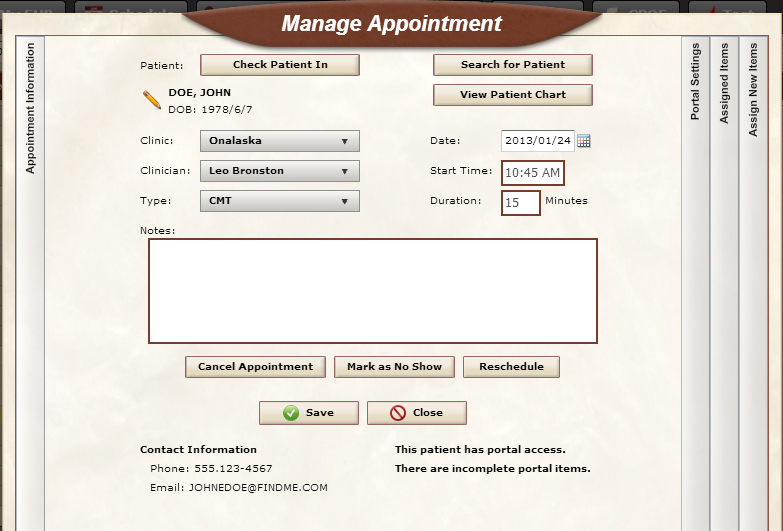 When the schedule is being viewed it will automatically refresh every 30 seconds so you can easily keep track of patient check ins. We have increased the size of the dropdowns throughout the system so you can see more options at once! What’s New in BackChart (Jan 27, 2013)? We have added the ability to track authorization forms. You can either track a paper version of the form, or if you are using the Patient Portal, you will be able to assign the authorization form to the patient. They will be able to sign the form through the portal. We can incorporate any authorization forms that you may be using in your practice now. Please see this support page for more information on authorization forms: here. When writing your notes, the text boxes will automatically resize to fit what you have entered. They start out as two lines tall. This will allow you to see your entire note while writing it without scrolling through each individual box. 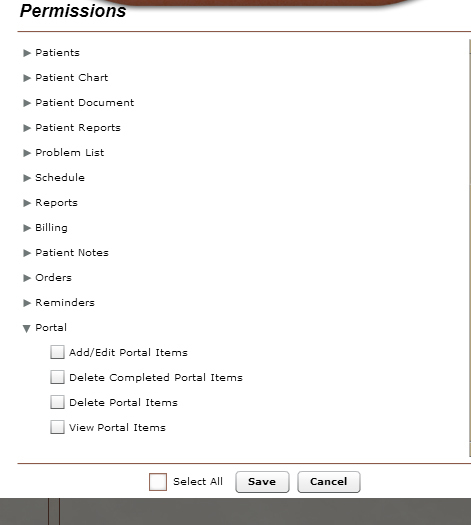 Patient Portal tabs – Manage a patient’s portal without opening the chart. The Consumer Assessment of Healthcare Providers and Systems (CAHPS) Survey is now available as an assignable item in the Patient Portal. Please contact us if you would like to make use of this tool. If you would like your survey to use different optional sections, we can customize it to suit your needs. The next time you are working on the edit incident window, take note of the DOL field. We are using a new date picker that allows you to either use the calendar to choose the date, or manually type the date in. Please let us know how well this works. 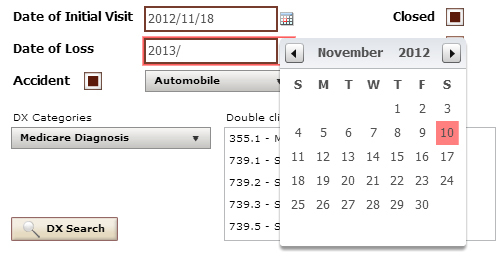 We are considering making all date fields work in the same way. We have added the following permissions that deal with managing assigned items. These permissions will not be selected by default. System Administrators will need to grant these permissions to the appropriate users in order for them to be able to manage assigned items. The default Consent for Use or Disclosure of Health Information Form that comes with BackChart can be reviewed below. potentially responsible for the payment of your services. operational purposes such as recall notices, reminder calls, and treatment news. privacy policies in detail. You have the right to review that notice before you sign this consent form. to our privacy practices, we will notify you in writing when you come in for treatment or by mail. restrictions. However, if we agree with your restrictions, the restriction is binding on us. You may revoke any of your authorizations at any time; however, your revocation must be in writing. your health information if they decide to contest any of your claims. The default HIPAA Information and Consent Form that comes with BackChart can be reviewed below. The Health Insurance Portability and Accountability Act (HIPAA) provides safeguards to protect your privacy. practice for years. This form is a “friendly” version. A more complete text is posted in the office. patient. We balance these needs with our goal of providing you with quality professional service and care. but must agree to abide by the confidentiality rules of HIPAA. government agencies or insurance payers in normal performance of their duties. policies to conform to your request. 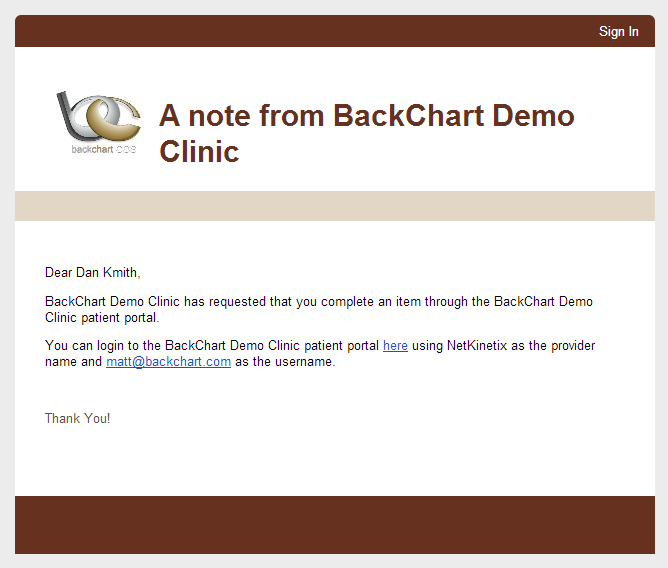 BackChart allows you to record any authorization forms you need to give to the patient. You can either make use of an electronic version of the form via the Patient Portal or you can scan a paper version of the form. We can add any forms specific to your practice. Send a copy of your form to BackChart Support. 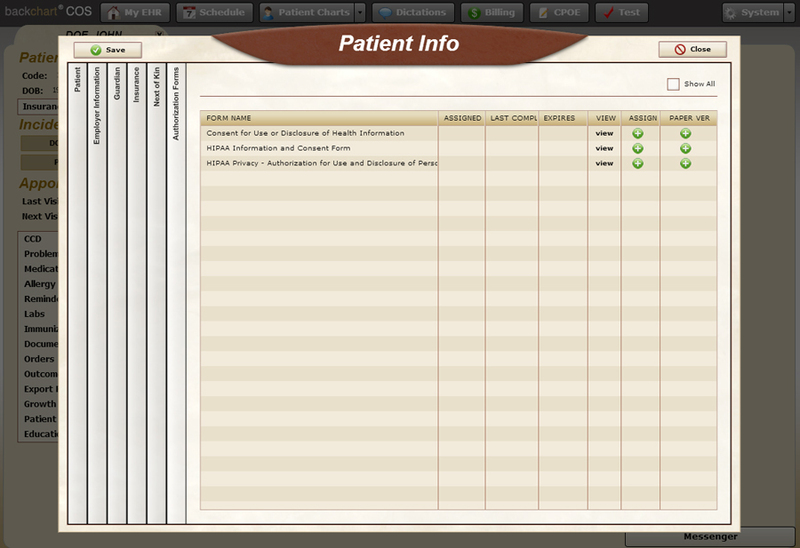 The “Authorization Forms” tab on the Patient Info window list all the authorization forms available in your BackChart system. This list gives you an overview of which forms a patient has completed, as well as, when they last completed the form. 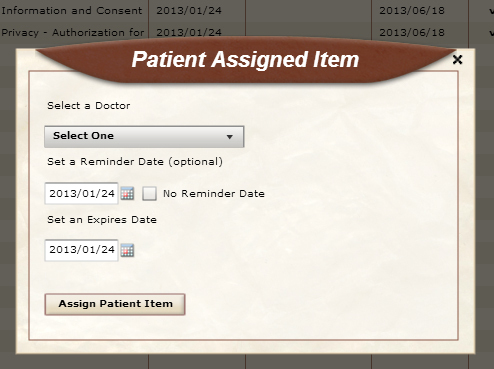 To have the patient complete a form through their Patient Portal, click the green plus icon in the “assign” column. 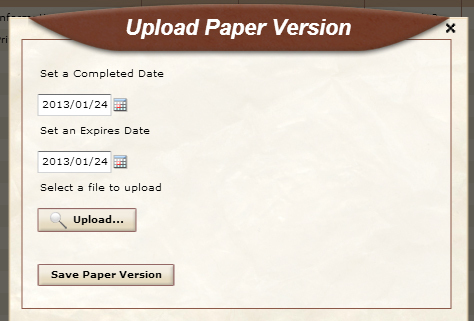 If the patient has completed the form on paper and you would like to scan and record that completion, click the green plus icon in the “paper ver” column. Clicking “view” will open the completed form. 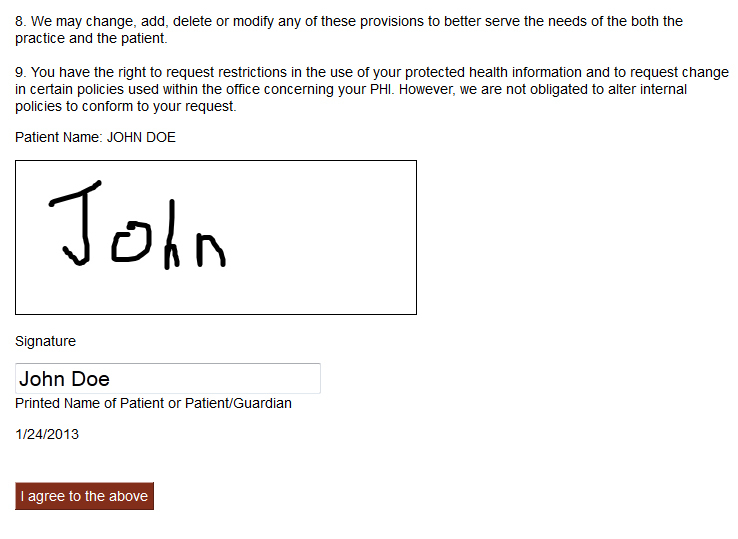 When the patient loads the form on their Patient Portal, they will be able to read through the form and agree by signing and typing their name at the bottom. File – The scanned version of the paper form. Questions about this topic? Use the form below to send us an email!